I have been trying to spread this around social media but if you don’t follow me on Facebook, Instagram, and/or Twitter, I just wanted to let you know that have I teamed up with Frank of The Crohn’s Colitis Effect to do a new video series. We already have a few videos up (with many more to come!) so don’t forget to subscribe to the YouTube channel. We both want this new series to encompass all things related to Inflammatory Bowel Disease. As most of you already know, there is so much that goes into life with Crohn’s Disease or Ulcerative Colitis. What has helped me the most was knowing I was not alone which is why this new video series will be dedicated to showing all parts of life as an IBD patient. Obviously, there are some things that are tough to get on video but we are going to really try to capture and discuss a lot of the various facets that go into life with a chronic illness. We really want to hear from you! We want this to be real talking with no phony-ness or bs. Pardon my language. It would help us if you let us know what topics are of interest to YOU and/or your family. Do you need a caregivers perspective? Do you want to hear someone else talk about how they cope with some embarrassing or “not easy to discuss” topics? Do you have any questions that would help you understand your diagnosis better? If we can’t answer your questions ourselves, we will find a way to point you in the direction of someone who can. Also, some of these issues might be better off in written form. If so, let us know so we can get a blog post going for you…and remember, if you have a question about something, I guarentee you there are many other people who are wondering and thinking about the same thing! As cliché as this sounds, Frank and I want to help. We want to make the world a better place for Frank’s ten year old son, for me, for Frank as his primary caregiver, for my parents and for the five million other people (and their families) struggling with Crohn’s Disease and Ulcerative colitis. 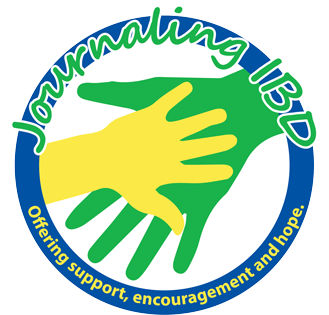 Please email us at marisa@journalingIBD.org or Frank@cceffect.org if you have any thoughts or feedback! Thank you in advance for your support. Looking forward to hearing and connecting with some of you.